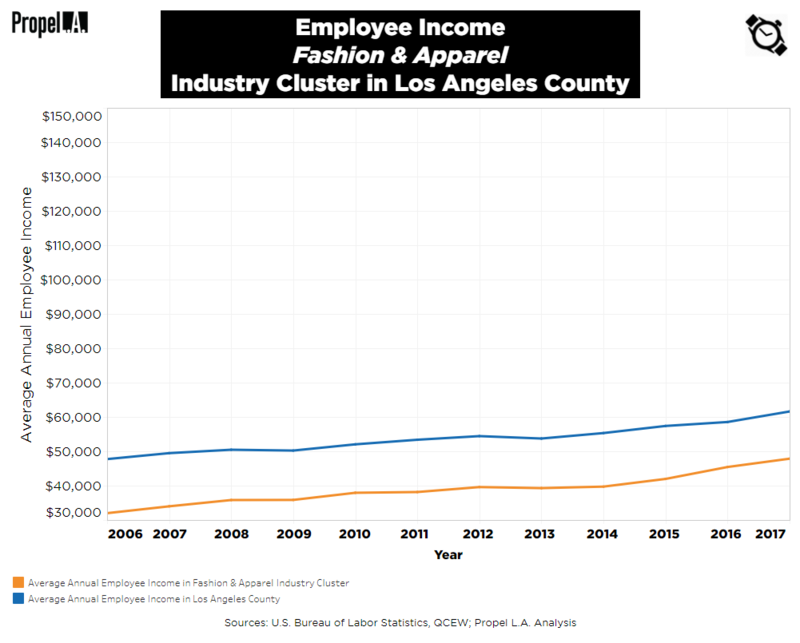 Employee Income of Fashion & Apparel Industry Cluster | Propel L.A. In Los Angeles County, the average worker in the Fashion & Apparel industry cluster (“Fashion”) has historically made about $10,000 to $15,000 less than the the average worker in any occupation. While the Fashion industry cluster’s average wage of $47,851 in 2017 is enough to cover the living wage of $28,163 needed for a single individual to cover their basic needs in Los Angeles County, it is not enough for a single working individual to provide for themself and a child ($60,840). What is the Fashion & Apparel industry cluster? The Fashion industry cluster is a key traded industry cluster in Los Angeles County. The cluster is composed of five industries: Textile Mills Manufacturing (NAICS 313), Apparel Manufacturing (NAICS 315), Footwear Manufacturing (NAICS 3162), Apparel Wholesaling (NAICS 4243), Other Leather and Allied Product Manufacturing (NAICS 31699), and Jewelry, Watch, Precious Stone, and Precious Metal Merchant Wholesalers (NAICS 42394) (Institute for Applied Economics, LAEDC, February 2018). This industry cluster is responsible for clothing, designer goods, and beauty products. To learn more about the state of the Fashion industry cluster, please read here. Average annual income was calculated in nominal wage by taking the weighted average of all private wages in the selected NAICS industries. NAICS industries were selected by using the definition of the industry cluster prepared for Otis College of Art and Design by the Institute for Applied Economics at the LAEDC (May 2017). Lastly, annual living wage is determined by the MIT Living Wage Calculator under the assumption that an individual works full-time at 2,080 hours a year.